In 1871, a Northern Pacific Railroad work crew set up camp where the railroad would cross the James River, adding another section to the new northern transcontinental line. In 1872, the U.S. Army established Fort Seward, a small post garrisoned by three companies (about 120 men) of the Twentieth Infantry Regiment, on a bluff overlooking the confluence of the James River and Pipestem Creek. The fort guarded the crossing of the James by the Northern Pacific Railroad. The fort only lasted five years, being decommissioned in 1877 - but the railroad remained, establishing a repair yard that was among the city's main industries until the 1960s. Jamestown was founded in 1872 and General Thomas Rosser of Northern Pacific named it after Jamestown, Virginia. The city incorporated in 1883. 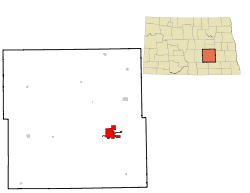 In 1873, Stutsman County became the first official county within Dakota Territory with Jamestown as the county seat. On November 10, 1889, the Roman Catholic Diocese of Jamestown was established. April 6, 1897 saw a change of name to Diocese of Fargo, with a change of the bishop's seat. Since 1995, the Diocese of Jamestown is listed as a titular see of the Catholic Church. Jamestown is located at 46°54′20″N 98°42′11″W﻿ / ﻿46.90556°N 98.70306°W﻿ / 46.90556; -98.70306 (46.905641, -98.702994) at the confluence of the James River and Pipestem Creek. According to the United States Census Bureau, the city has a total area of 12.87 square miles (33.33 km2), of which, 12.83 square miles (33.23 km2) is land and 0.04 square miles (0.10 km2) is water. Jamestown has a typical northern prairie' American climate, summer can be warm and moderately humid but the winters are colder than the southernmost typics found. In the Köppen classification is Dfb (humid continental climate), although warmer in the summer and less humid that New England. As of the census of 2010, there were 15,427 people, 6,567 households, and 3,555 families residing in the city. The population density was 1,202.4 inhabitants per square mile (464.2/km2). There were 6,983 housing units at an average density of 544.3 per square mile (210.2/km2). The racial makeup of the city was 94.6% White, 0.8% African American, 1.8% Native American, 0.6% Asian, 0.1% Pacific Islander, 0.7% from other races, and 1.4% from two or more races. Hispanic or Latino of any race were 2.1% of the population. There were 6,567 households of which 24.8% had children under the age of 18 living with them, 41.3% were married couples living together, 8.7% had a female householder with no husband present, 4.1% had a male householder with no wife present, and 45.9% were non-families. 39.4% of all households were made up of individuals and 16.1% had someone living alone who was 65 years of age or older. The average household size was 2.09 and the average family size was 2.78. The median age in the city was 39.9 years. 19.7% of residents were under the age of 18; 12.1% were between the ages of 18 and 24; 23.8% were from 25 to 44; 27.1% were from 45 to 64; and 17.3% were 65 years of age or older. The gender makeup of the city was 50.2% male and 49.8% female. In October, 2016 the North Dakota Housing Finance Agency projected that Jamestown would lose 2.1% of its population by the next census. It also reported that it projected a 4% population drop in the nine counties surrounding Jamestown and is considered Jamestowns primary trade area. As of the census of 2000, there were 15,527 people, 6,505 households, and 3,798 families residing in the city. The population density was 1,246.7 per square mile (481.5/km²). There were 6,970 housing units at an average density of 559.6 per square mile (216.2/km²). The racial makeup of the city was 96.84% White, 0.36% African American, 1.21% Native American, 0.49% Asian, 0.05% Pacific Islander, 0.27% from other races, and 0.78% from two or more races. Hispanic or Latino of any race were 1.19% of the population. The top 6 ancestry groups in the city are German (54.0%), Norwegian (22.4%), Irish (9.0%), English (6.6%), Swedish (4.1%), Russian (3.8%). Many area families cite their heritage as "Germans from Russia", in reference to ethnic Germans who settled in the Russian Empire in the 18th century, many of whose descendants emigrated to the United States in the late 19th century. There were 6,505 households out of which 27.3% had children under the age of 18 living with them, 46.8% were married couples living together, 8.8% had a female householder with no husband present, and 41.6% were non-families. 37.0% of all households were made up of individuals and 16.2% had someone living alone who was 65 years of age or older. The average household size was 2.17 and the average family size was 2.85. The age distribution is 21.7% under the age of 18, 12.7% from 18 to 24, 25.7% from 25 to 44, 21.8% from 45 to 64, and 18.1% who were 65 years of age or older. The median age was 39 years. For every 100 females, there were 92.0 males. For every 100 females age 18 and over, there were 88.4 males. The median income for a household in the city was $31,500, and the median income for a family was $42,245. Males had a median income of $28,310 versus $20,225 for females. The per capita income for the city was $16,686. About 6.5% of families and 10.7% of the population were below the poverty line, including 12.4% of those under age 18 and 10.8% of those age 65 or over. Jamestown has a strong precision manufacturing base as well as food processing, agriculture, retail and wholesale businesses. Notable companies headquartered in Jamestown include ACI (Agri-Cover, Inc.), Dura Tech Industries, and Midwestern Machine, and additional major employers include Cavendish Farms and UTC Aerospace Systems. Service facilities for trucking and heavy equipment repair are also located in Jamestown. The Jamestown Stutsman Development Corporation  supports joint business and industrial development within the city and Stutsman County, North Dakota. Four designated industrial parks  adjoin the city or are part of joint city/county development efforts: Bloom Business Park, I-94 Business Park, Spiritwood Energy Park (which includes Great River Energy and Cargill), and the Airport Business Park. Jamestown Reservoir, a series of three, interlocking, 12-mile-long artificial lakes formed by Jamestown Dam, a flood control a dam on the James River at the north end of the city, is home to watersports and recreational fishing. Jamestown is home to two 18-hole golf courses—Hillcrest Golf Course and Jamestown Country Club—as well as the Jamestown Civic Center, which hosts concerts, University of Jamestown basketball games, other large events, and the North Dakota Sports Hall of Fame; other sporting facilities include Jack Brown Stadium, one of North Dakota's historic baseball parks. Jamestown is also home to two disc golf courses, an 18-hole recreational course in Klaus Park, and a 27-hole championship course on the island and surrounding land in the Jamestown Reservoir. The Island Course was the site of the 8th Annual North Dakota Disc Golf Championships in 2007. The city of Jamestown is also home to The Jamestown Arts Center  (), located in the heart of downtown. The Arts Center is home to a year-round exhibition gallery, community theater stage, a venue for visual arts performances, art workshops and classes, ceramics studio and a beautiful green space known as The Art Park. Jamestown also features the World's Largest Buffalo, a 26-ft tall sculpture of an American bison. Jamestown Regional Airport serves the city providing scheduled flights to all four major North Dakotan metropolitan areas, as well as chartered flights out of state. Jamestown is served by the Jamestown Public Schools. The system operates five elementary schools, one middle school, one high school, and one alternative high school. Louis L'Amour Elementary School is named for the popular western writer Louis L'Amour who was born in Jamestown. There are also two private elementary schools in Jamestown; Saint John's Academy, a K-6 Catholic school, and Hillcrest School, a Seventh-day Adventist school. University of Jamestown is a private liberal arts college founded by the Presbyterian Church and located on the north side of town. Its current enrollment is approximately 1000 students. Ranked by U.S. News & World Report in the top tier of regional undergraduate institutions, it is also notable among religious colleges for having been a co-educational institution from its founding in 1883. Its first fall term was opened at 9 a.m. on Tuesday, Sept. 29, 1886. After financial hardships, affecting the entire county, Jamestown College had to close its doors in the spring of 1890. On Sept. 22, 1909 Jamestown College reopened after a population growth in the State due to improved farming methods. With no higher education available between Fargo, ND (100 miles East) and Missoula, MT (700 miles West), Jamestown College became a successful school. On the northwest side of the city and almost adjacent to the site of historic Fort Seward is The Anne Carlsen Center (formerly known as the "Crippled Children's School"). A privately funded residential school, it has long been one of the country's leading centers for treatment and education of severely handicapped children. Because of the school's locale, Jamestown became the first city in America to require wheelchair cutouts in newly constructed sidewalk curbs. The local daily paper is the Jamestown Sun. Michael John Fitzmaurice, a former United States Army soldier and a recipient of the United States military's highest decoration—the Medal of Honor—for his actions in the Vietnam War. ^ "Jamestown History". Liechtyrealestate.com. Archived from the original on 2012-09-08. Retrieved 2013-02-16. ^ "Jamestown, North Dakota Köppen Climate Classification (Weatherbase)". Weatherbase. Retrieved 2018-11-30. ^ "MONTHLY - ALL WEATHER AVERAGES". WeatherBase. Retrieved 2018-11-30. ^ "Архив климатических данных". Climatebase.ru. Retrieved 2018-11-30. ^ United States Census Bureau. "Census of Population and Housing". Archived from the original on May 12, 2015. Retrieved July 22, 2013. ^ "Welcome to Jamestown Middle School". www.jamestown.k12.nd.us. Retrieved 2018-02-27. ^ "Welcome to Jamestown High School". www.jamestown.k12.nd.us. Retrieved 2018-02-27. ^ "Our History". University of Jamestown. 2015. Retrieved 2015-05-01. ^ Lawrence Kestenbaum. "Political Graveyard". Political Graveyard. Retrieved 2013-02-16. ^ Jackson, William (2008). Almanac of North Dakota mysteries & oddities, 2009-2010. Valley Star Books. p. 59. ISBN 9780967734989. OCLC 259419005. 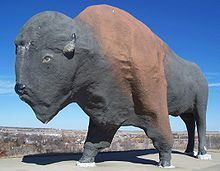 Wikivoyage has a travel guide for Jamestown, North Dakota. Wikisource has the text of a 1911 Encyclopædia Britannica article about Jamestown, North Dakota. This page was last edited on 14 April 2019, at 21:28 (UTC).